The Jungheinrich AM I20 stainless steel pallet truck with 1,140 mm fork length is ideal for use in the food industry or in areas prone to high levels of corrosion, such as those encountered in the chemical and pharmaceutical industries. 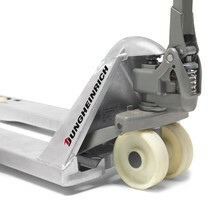 The Jungheinrich AM G20 hand pallet truck is ideal for outdoor use. The hot-dip galvanised surfaces offer effective corrosion protection in damp working environments. The Jungheinrich AM I20p hand pallet truck is a premium stainless steel pallet truck in professional design for use in the food, chemical or pharmaceutical industry. It is fully corrosion and acid-resistant and meets the most stringent hygiene requirements. The Jungheinrich AM G20 Galvinox hand pallet truck with 1,150 mm fork length is ideal for use in outdoor areas. The hot-dip galvanised surfaces offer effective corrosion protection in damp working environments. This entry-level model offers you the benefits of a stainless steel scissor lift pallet truck for occasional use in an affordable package. Just a single unit can be used to transport pallets with capacities of up to 1000 kg and raise them to an optimum working height. This Jungheinrich hand pallet truck is ideal for transporting goods across short distances and offers tried-and-tested Jungheinrich quality to satisfy the most exacting demands. It is equipped with the basic weight display of the AMW 22 series. The Jungheinrich AM I20 stainless steel pallet truck with short forks is ideal for use in the food industry or in areas prone to high levels of corrosion, such as those encountered in the chemical and pharmaceutical industries. The Jungheinrich AM I20 hand pallet truck with long forks is ideal for use in the food industry or in areas prone to high levels of corrosion, such as those encountered in the chemical and pharmaceutical industries. 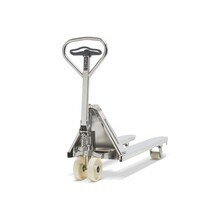 The AM I20 stainless steel pallet truck is particularly beneficial in areas with high hygiene requirements. The professional version of the Jungheinrich AM I20p stainless steel pallet truck with short forks is designed for use in the food, chemical or pharmaceutical industry. It is fully corrosion and acid-resistant and meets the most stringent hygiene requirements. The professional version of the Jungheinrich AM I20p stainless steel pallet truck with width across forks of 680 mm and 1,140 mm fork length is designed for use in the food, chemical or pharmaceutical industry. It is fully corrosion and acid-resistant and meets the most stringent hygiene requirements. The distance across forks of this special version measures 680 mm, making it ideal for transporting wide pallets or sideways lifting of special pallets. The Inox version of the electro-hydraulic Jungheinrich AMX I15e scissor lift pallet truck is a premium product from Jungheinrich. Devices made entirely from stainless steel are not always necessary. 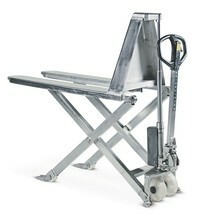 This stainless steel pallet truck features components with different surface finishes. It is ideal for use in the food industry or in areas prone to high levels of corrosion, such as those encountered in the chemical and pharmaceutical industries. The AMX I15e is particularly beneficial in areas with high hygiene requirements. The Jungheinrich AM I20 stainless steel pallet truck with width across forks of 680 mm and long forks is ideal for use in the food industry or in areas prone to high levels of corrosion, such as those encountered in the chemical and pharmaceutical industries. The distance across forks of this special version measures 680 mm, making it ideal for transporting wide pallets or sideways lifting of special pallets. The Inox professional version of the manual-hydraulic Jungheinrich AMX I15p scissor lift pallet truck is a premium stainless steel pallet truck. It is fully corrosion and acid-resistant and meets the most stringent hygiene requirements. This makes the scissor lift pallet truck ideal for humid and harsh environments or applications with stringent hygiene requirements. It is particularly well suited to the chemical, pharmaceutical and food industries. The professional version of the Jungheinrich AM I20p stainless steel pallet truck with long forks is designed for use in the food, chemical or pharmaceutical industry. It is fully corrosion and acid-resistant and meets the most stringent hygiene requirements. The professional version of the Jungheinrich AM I20p stainless steel pallet truck with width across forks of 680 mm and long forks is designed for use in the food, chemical or pharmaceutical industry. It is fully corrosion and acid-resistant and meets the most stringent hygiene requirements. The distance across forks of this special version measures 680 mm, making it ideal for transporting wide pallets or sideways lifting of special pallets. The professional version of the Jungheinrich AM I20p stainless steel pallet truck with width across forks of 680 mm and short forks is designed for use in the food, chemical or pharmaceutical industry. It is fully corrosion and acid-resistant and meets the most stringent hygiene requirements. 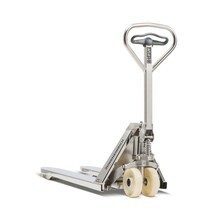 The distance across forks of this special version measures 680 mm, making it ideal for transporting wide pallets. The Jungheinrich AM I20 stainless steel pallet truck with width across forks of 680 mm and 1,140 mm fork length is ideal for use in the food industry or in areas prone to high levels of corrosion, such as those encountered in the chemical and pharmaceutical industries. The distance across forks of this special version measures 680 mm, making it ideal for transporting wide pallets or sideways lifting of special pallets. The Jungheinrich AM I20 stainless steel pallet truck with width across forks of 680 mm and short forks is ideal for use in the food industry or in areas prone to high levels of corrosion, such as those encountered in the chemical and pharmaceutical industries. 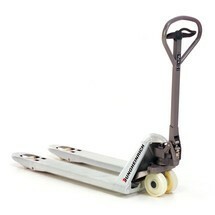 The distance across forks of this special version measures 680 mm, making it ideal for transporting wide pallets.